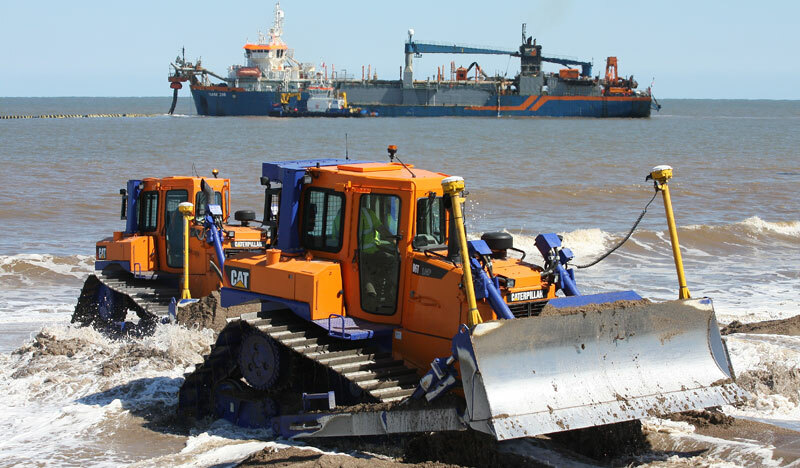 The Lincshore beach re-nourishment works, undertaken by Team Van Oord in 2015 and 2016 on behalf of the Environment Agency, were showcased recently at an annual gathering of Europe’s coastal engineers. Around 80 delegates who attended ‘KRING 2016’ made a site visit to Project Lincshore as part of the three-day event held on 25-27 September. KRING is an annual event for coastal engineers and scientists in the United Kingdom, the Netherlands and other countries bordering the North Sea and Baltic. The event provides an opportuntiy for those attending to collaborate and share best practice, with the common goal of advancing approaches to coastal erosion and flood risk management. The 62nd KRING meeting was hosted by the Environment Agency in Lincolnshire and included a focus on flood and coastal defence schemes located on England’s north east coast. Project Lincshore is the Environment Agency’s flagship scheme to replenish Lincolnshire beaches, thereby helping reduce flood risk to thousands of homes and businesses along the coast. The scheme involves dredging sand from a designated offshore location using a Trailing Suction Hopper Dredger. The material is then pumped to the shore via a floating pipeline, and replaces sand lost during winter storms. The sand is required to maintain effective protection of the primary hard sea defences by reducing the risk of waves reaching and overtopping the main sea defences, thereby protecting them from damage and erosion. Project Lincshore, which first began in 1994, replenishes the beaches between Skegness and Mablethorpe and, in the immediate coastal floodplain, protects 20,000 residential properties, 1,700 commercial properties, 30,000 static caravans, 35,000 hectares of high grade agricultural land and £bns of infrastructure. This year, around 350,000 cubic metres of sand obtained from Crown Estate licensed offshore dredging areas was used to reinstate the beaches to their design level and profile. Team Van Oord was invited by the KRING organising committee to assist the Environment Agency in presenting and showcasing the project. Andrew Rouse, Environment Agency Project Executive and Paul Hesk, Team Van Oord Regional Manager described the project’s history, importance and delivery before leading a guided tour of a stretch of the site from Acre Gap to Sandiland Golf Club. Ian Hodge, Deputy Director, Investment and Delivery Assurance FCRM, Environment Agency, said: “This year’s meeting of the KRING was a great success and we’ve had some really fantastic feedback.